Along with a new student lounge, the additional space includes new meeting rooms and offices for administration. 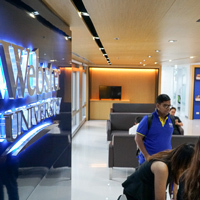 Webster University Thailand announced the recent completion of Bangkok campus expansion. Effectively doubling the size of the Empire Tower-based Bangkok metro campus location, the expansion incorporates a series of new developments including several new classrooms and a new library. With student comfort and accessibility in mind, Webster University’s Bangkok location now covers two whole floors inside Empire Tower's, EM Space Zone. This offers students plenty of space to study, relax and socialize. The additional space also features new meeting rooms and offices for Webster’s administration, including the Office of Career Planning and Development, Counsellor’s Office, Office of Finance, and the Office of Marketing and Communications. These developments showcase commitment to improving the learning environment of staff and students alike. Read more about Bangkok's expansion here.